Because I have no idea how behind I really am, here's 3 new Arrivals! 17" Clawdeen who I'm thinking of cujstomizing~ but i'm not confident in my skillls so i'm not sure :/. & the cutest monchichi ever! ALSO here's an update on my custom ! Her face up is complete, besides that hole i need to disguise some how, and i'm working on her wig at the moment...i didn't order enough hair. I also need to make another jumpsuit for her, my first sewing machine attempt was a little messy! And i still need some props. but shes coming along! what do you guys think of her lips? I feel like they're too...full? and look messy ;-;. Congratulations on acquiring 17-inch Clawdine Wolf! Customizing looks like a lot of work, but as you say, she's coming along! I think she'll be a really fun custom when her hair is fuller and as you complete the face-up! Congrats on your haul! Can't wait to see your custom finished! Oh wow, you're making the wig too! I have no idea how to make doll wigs, so that sounds pretty impressive. Interested to see how she turns out. Congrats on your new arrivals too, and yay for minis!! I think her lips look okay, but then again I’m not really familiar enough with the character to know how they compare. She’s coming along nicely! 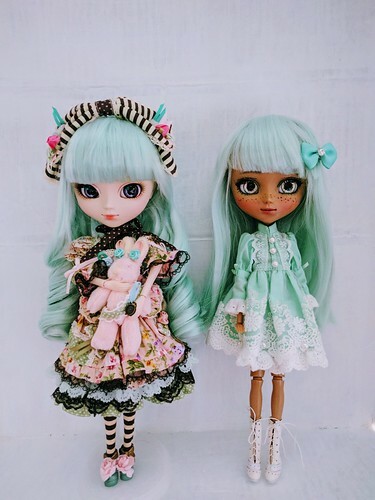 MEGA UPDATE PT.1 : Pullip Family! If you see (name?) by my dolls it means they haven't been named, and i need suggestions! So if anything pops to mind please let me know! Thanks! Nella Retro! (name?) Her antler headband I made, and her dress is from alie ress! I was going for a goddess look! Hook/Sol Hybrid (name?) He did have horns, which i plan to remake (to heavy) and he has a lovely Kimono en route by kittensquid! He's the companion doll to Nella. Mint Alice du Jardin (name?) & Chocolate mint custom!(name?) 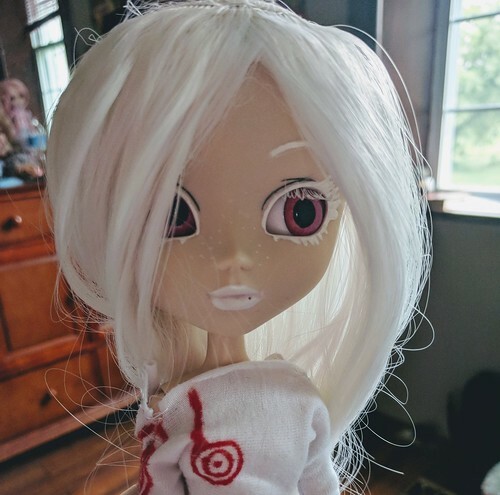 Writing this post i realize i have like names for none of my dolls. Please help! 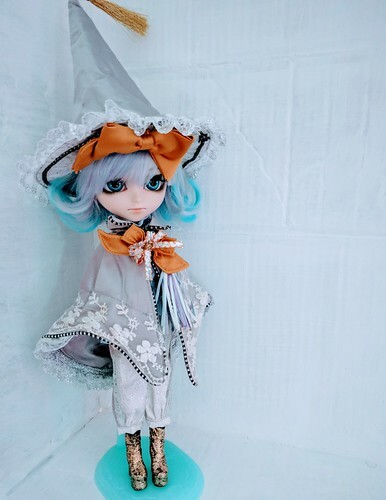 Anyway Mint alice was my first pullip! The custom girl is from a mocha kit, she came to me as a finished custom, but i wiped everything (and added new chips! )but her blush and freckles and re did her look! Angelique! 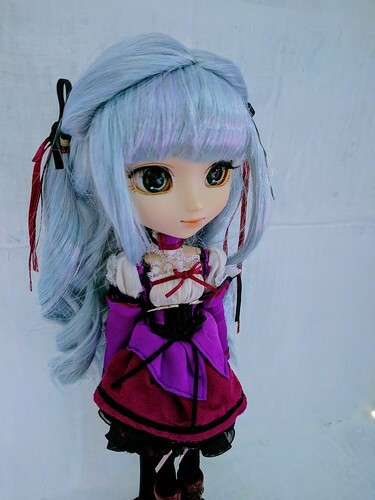 My grail doll for a long time, (she ended up coming from germany! )because i really enjoyed the anime. I think her face could have been done with a more sweet look to reflect the character, but i'm not going to redo her(too much pressure). Lumiere His name is perfect, everything about him is perfect. He's my only isul and another grail of mine. 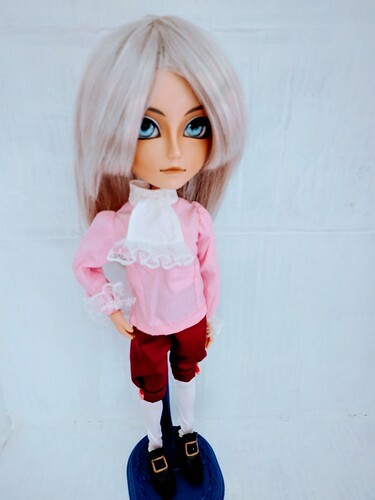 pullipstyle went out of stock of him and i was devastated, but they randomly got one back in stock and he was mine! 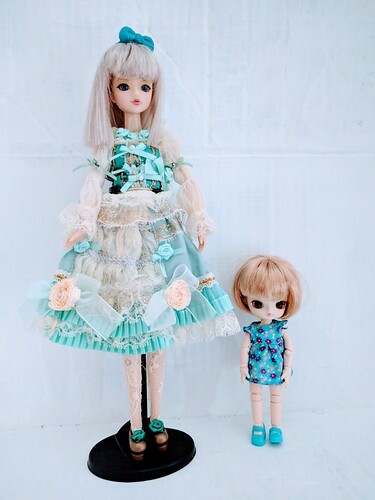 Cosette(byul cocotte) & Princess Pinky! (name?) 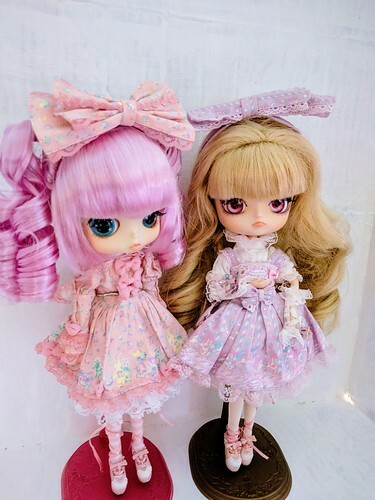 Pinky is in another AP stock outfit, and they are my lovely AP twins! Cosette has never had her wig or eyes removed, where as pinky has new chips, and has worn a couple different wigs. Princess Minty(name?) Minty was wearing her own stock wig for a bit but just got this new handmade yarn wig! I made her unicorn suit out of socks, and a clay horn. Shes also wearing homemade eye chips! Jdoll Esplandi Kate(name?) & mini dal white rabbit(name?) 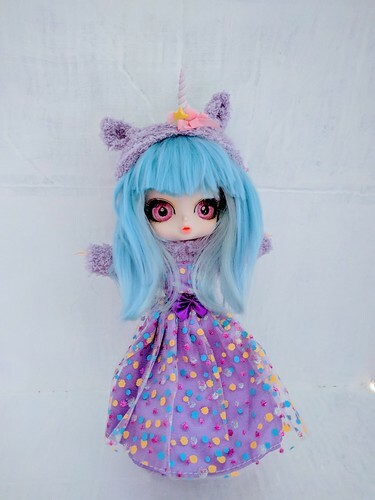 my first jdoll in princess minty's stock. Her wig is very...hard to style, so getting a new one is on my list for her. & my only mini on an obitsu! 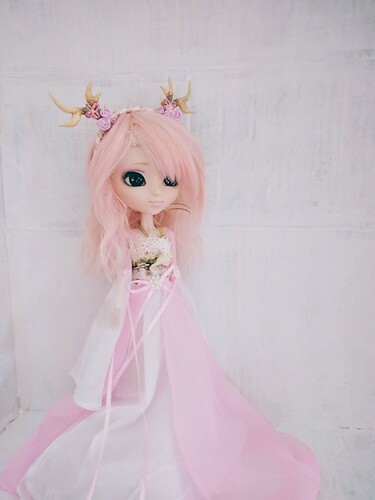 Since i have only have one blythe i'll post her here as well. She also doesn't have a name, surprise. I accidently poked a hole in her face trying to carve, which i could try and fix with epoxy putty but idk. I'm a bit unhappy with how she came out, but i think some new hair might revive her. Hope you all enjoyed! Photos of the rest of my collection, MH & others is coming soon! Now, that's one huge update. So many beautiful dolls! What a magnificent, fantasy-themed, colorful collection! They are all truly wonderful! Wow, what a lot of new additions! I really like your Nella best of this bunch -- she looks quite ethereal and I like yours better than the stock one. And cheers for a J-Doll! That yarn wig is really cute on Minty!